Step 1 make an incredible crab cake. Step 2 pile several slices of creamy avocado, crisp red onion, a dollop of tartar sauce and for good health, some fresh lettuce. bread of your choice! 8 slices! Preheat a deep fryer to 375F-400F. Dust the patties with reserve bread crumbs. Fry until deep golden brown. 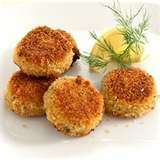 *If you don’t have a deep fryer, you can still make the crab cakes! Just add 1 cup vegetable oil in a frying pan and heat over medium/high.